A new, revised and expanded edition of Captive Hearts, Captive Minds, a much referred to book on gaining freedom and recovery from cults and abusive relationships is now available under the title, Take Back Your Life: Recovering from Cults and Abusive Relationships [Kindle edition]. 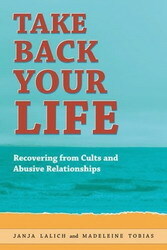 Rewritten throughout, the new edition contains significant new material on children born and/or raised in cults, abusive relationships and family cults, as well as contributions from professionals working with cult survivors. Cult victims and those who have suffered abusive relationships often suffer from fear, confusion, low-self esteem, and post-traumatic stress. Take Back Your Life explains the seductive draw that leads people into such situations, provides guidelines for assessing what happened, and hands-on tools for getting back on track. Written for the victims, their families, and professionals, this book leads readers through the healing process. A resource list and numerous personal accounts of those who have successfully made the transition to the “normal” world provide help and inspiration. Janja Lalich, Ph.D., is Associate Professor of Sociology at California State University, Chico. She has been studying the cult phenomenon since the late 1980s and has coordinated local support groups for ex-cult members and for women who were sexually abused in a cult or abusive relationship. Madeleine Tobias, M.S., R.N., C.S., is the Clinical Coordinator and a psychotherapist at the Vet Center in White River Junction, Vermont, where she treats veterans who experienced combat and/or sexual trauma while in the military. Previously she had a private practice in Connecticut and was an exit counselor helping ex-members of cultic groups and relationships.